Emily Cavin prepares for a kill while her teammates are ready to back her up during last Saturday’s playday at CHSS. The girls went 4-0. The senior girls volleyball team at Charles Hays Secondary School (CHSS) is ready for the zone championships on Nov. 19. Nov. 11, 2016 7:00 a.m. The senior girls volleyball team at Charles Hays Secondary School (CHSS) is primed and ready for the zone championships on Nov. 19 after another outstanding showing last weekend. The team has steamrolled most of its competition this season, enroute to what is now a 12-1 record on the year. At CHSS on Saturday, the girls went 4-0 once again without losing a single set. Krista Johnson, who coaches the team along with Nancy Le and Jackie Jackson, said the girls played well and highlighted their passing, but said there’s still more to work on. “Coverage and footwork,” she said. “We want to have less balls drop in front of them. There were a lot of dropped balls that can be easily fixed with communication and footwork,” she said. The group beat Hazelton 25-15 and 25-9 and Mount Elizabeth Secondary School 25-15 and 25-10. The girls played Centennial Christian School (CCS) twice, because Johnson said they are the best team they’ve faced so far and they wanted the practice for zones. Although there was more of a challenge in the second game, the Rupert squad still won every set. In game one, the girls won 25-16 and 25-10. In game two, CHSS rallied from a ways down to come back and win 25-22, then easily defeated CCS 25-10 in the next set. Johnson said team captains Suttira Johansen and Helen Vo were key players throughout the day. With the way the girls have played, zone championships are a very real possibility and Rupert is going in as the favourite. “As long as the planets are aligned right, we’re pretty confident we’ll win,” said Johnson. Johansen also sees the girls as favourites. 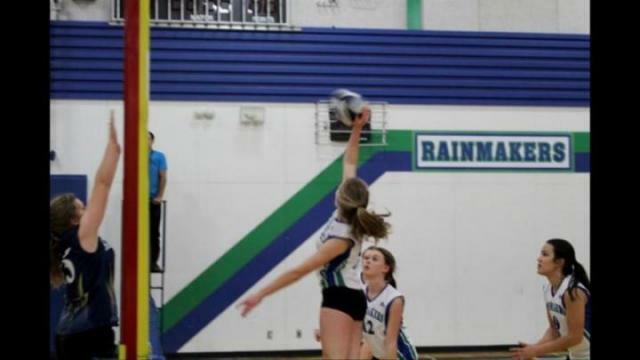 In her Grade 12 year, she hopes she can help bring home her first and only volleyball zone banner. She said the girls have been so successful because they have chemistry on and off the court. “We’re all friends with each other, we have inside jokes, we talk on and off the court, which is really good to have in teammates,” she said. The girls have come a long way from their first play day at the end of September and they’re ready for the challenge that lies ahead. “We’ve gelled as a team better and our overall skills are better than they were at the beginning of the season,” said Johansen. The team will play some just-for-fun games on Friday with the junior boys and alumni players. Zones will be held in Kitimat on Nov. 19.